It doesn’t matter how old I am, I will always look forward to digging into my stocking on Christmas morning. My husband really does an amazing job at putting the best things in my stocking. Make-up, small kitchen utensils, hair ties, costume jewelry and so many other awesome gifts! He always goes above and beyond to include those small things that I absolutely adore. However, when it comes to his stocking…I fail..every year! I love buying him gifts but putting together a stocking for him, is downright hard! This year, I put together a list stocking stuffer ideas for me that I know will be perfect in his stocking. 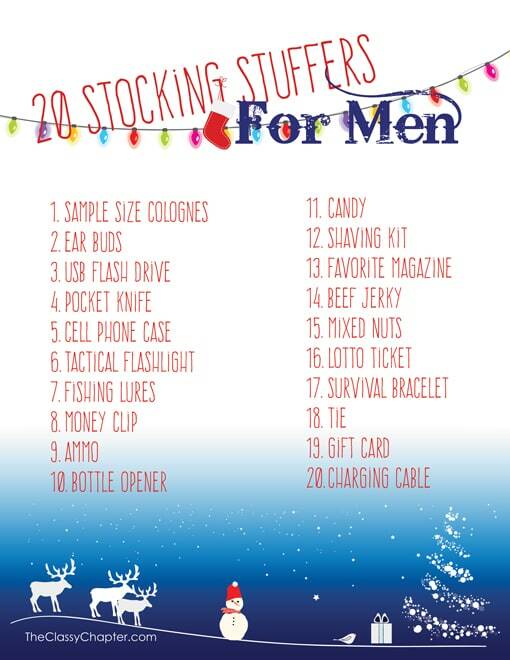 I hope a few of the items on the list help you create the perfect stocking for the man in your life! 1. Cologne You can’t go wrong with purchasing your man’s favorite scent. Bonus points, he’ll smell good for you! 2. Ear Buds I don’t know about your hubby but mine is always losing his ear buds, so this is a great stocking idea. 3. USB Flash Drive Affordable and always comes in handy. 4. Pocket Knife Every man needs a good pocket knife. It makes a great stocking present. 5. Cell Phone Case Phones are so expensive so make sure you grab a good case. 6. Tactical Flashlight Always good to have extra flashlights around the home. 7. Fishing Lures- I don’t know much about fishing lures but my husband seems to like them. 8. Money Clip Your hubby might not use a money clip but if you grab him a nice one, it’s a great keepsake. 9. Ammo – My husband is a hunter, so this is always a favorite for him. 10. Bottle Opener – Might as well grab him a case of beer as a gift too. 11. Candy – Grab him his favorite candy. 12. Shaving Kit A shaving kit is always a must for a man. 13. Favorite Magazine – Car magazines, home improvement, hunting, food magazines, the list is really endless. 17. Survival Bracelet Some of these survival bracelets are super handy! What do you normally put in your husband’s stocking? Make sure to follow me on Pinterest for more posts like this. My hubby is obsessed with Siracha so he is getting a siracha sauce keychain with the actual miniature version of it…haha! Haha, I love that! I should get that for my husband. I love all these ideas! I need to print this out and go shopping. I have 4 men and a man in training on my Christmas list this year. This is going to help A LOT! Tabitha Vos recently posted…COGITO watches are great for the holidays! Get a $50.oo in store gift code!